A tripartite meeting between the Ministry of Labour and Social Welfare, the Lao National Federation of Trade Unions, and the National Chamber of Commerce and Industry was held last week in Vientiane to discuss the raise of minimum wage from current 900,000 kip, approximately US$109, per month. 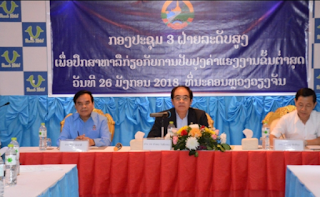 The meeting was co-chaired by Minister of Labour and Social Welfare Khampheng Xaysompheng, Vice President of the Lao National Federation of Trade Unions Simoun Onelasy and Vice President of the National Chamber of Commerce and Industry Vanthong Sitthikoun. Representatives of relevant sectors were also present at the meeting. All three parties have different points of view on the raising of the minimum wage as the National Federation of Trade Unions proposed a minimum wage of 1,200,000 kip/month, or an increase of 33.33% from the current rate 900,000 kip. Meanwhile the National Chamber of Commerce and Industry suggested a minimum wage of 1 million kip per month, a rise of 11.11% from the current rate. The proposed rate is lower than that proposed by the Ministry of Labour and Social Welfare which stands at 1.1 million kip/month, a rise of 22.22%. The Ministry of Labour and Social Welfare is expected to report the result of the meeting to the government for consideration in coming months.